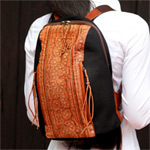 This handsome backpack is hand-crafted by Chiang Mai's bags artisans with cotton and leather. The front side boasts two zipped pockets and intricate patterns embroidered by hill-tribe women. The back features a small handle to carry the bag by hand. The interior is lined in velvet, and features one zipped pocket to keep items secure. The bag itself closes with a zipper. The straps are adjustable. This bag will lend an ethnic touch to any modern outfit. Materials: Cotton 50%, velvet 40% and leather 10% .